Betty Bee has been a doll lover since childhood. She still has her Bye-Lo and Dream Baby Dolls. Her Bye-Lo was named Geraldine and her cousin, Virginia, had exactly the same doll whose name was Nadine. Their grandmother sewed baby clothes for the dolls. Betty Bee has been collecting and selling dolls for 30 years, specializing in Effenbee Dolls but she has added several more lines over that time. She has been doing most of her selling at doll shows around central Florida, averaging two shows a month. 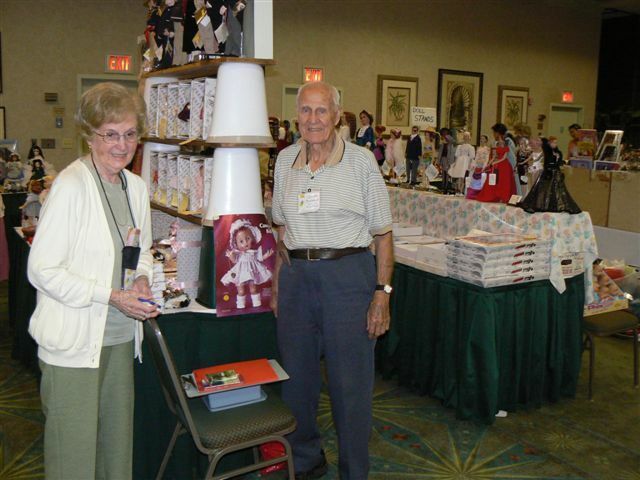 She and her husband, Quentin, who is known as the "book man" in Central Florida, have been delegates from their clubs for twenty years to the United Federation of Doll Clubs' Conventions held every summer. Betty has entered her dolls and bears in many regional and national convention exhibits and has been thrilled to receive a few different colored ribbons. For the last ten years, Betty Bee has been in charge of the yearly doll shows in Leesburg, Florida put on each year by her doll clubs. Proceeds from these shows have been given to local charities in Lake County, Florida. Betty Bee and her husband, Quentin, are helped in their business by their youngest son David, and this web site is now dedicated to serving our customers.